AUSTIN, Texas - YETI Coolers, manufacturers of ultra-durable, super-insulated premium coolers for serious outdoor enthusiasts, is happy to introduce the new Roadie® 20 model to its line-up. Continually raising the bar for cooler design, YETI has merged the convenience and portability from previous Roadie® models with the proven functionality and features of their Tundra® model coolers. The result is the Roadie® 20, the ultimate combination of performance, durability and portability. The new Roadie® 20 is specifically designed to accompany outdoor enthusiasts on their adventures afield. It is the perfect cooler for hunters and fishermen, who desire a premium cooler, yet have limited space for their gear. "We designed the Roadie® 20 specifically for those active people that demand performance but still want a cooler that is easy to carry," stated YETI Coolers founder and CEO Roy Seiders. "Customer feedback played a large part in the development of this cooler." The unique, full-length stainless steel handle locks upright for easy carrying with one hand, and the body was designed to accommodate longneck bottles. Seiders continued, "No other product offers the features and functionality of the Roadie® 20." Like all YETI® Coolers, the new Roadie® 20 is rotational-molded. This is the same process used to make rugged whitewater kayaks and results in dramatically superior durability compared to traditional coolers. The thicker walls of the Roadie® 20 are filled with YETI's PermaFrost™ Insulation, providing exceptional thermal resistance for superb ice retention. Other features include T-Rex™ Lid Latches that keep the lid securely closed and are built to last, a full-length NeverFail™ Hinge System that will not fail, AnchorPoint™ Tie-Down Slots for solid mounting, integrated padlock ports and a full-frame ColdLock™ Gasket that seals in cold. And, like every YETI®, the Roadie® 20 is Dry Ice Compatible™. 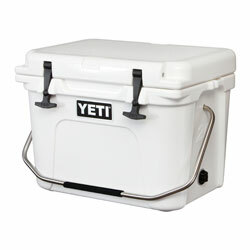 The new YETI® Roadie® 20 measures 18-1/2" L x 13-5/8" W x 14-3/8" H and is available in white and desert tan. For more information on the Roadie® 20, including photos and video, visit www.yeticoolers.com/Roadie20. YETI® Coolers – Wildly stronger! Keep ice longer!